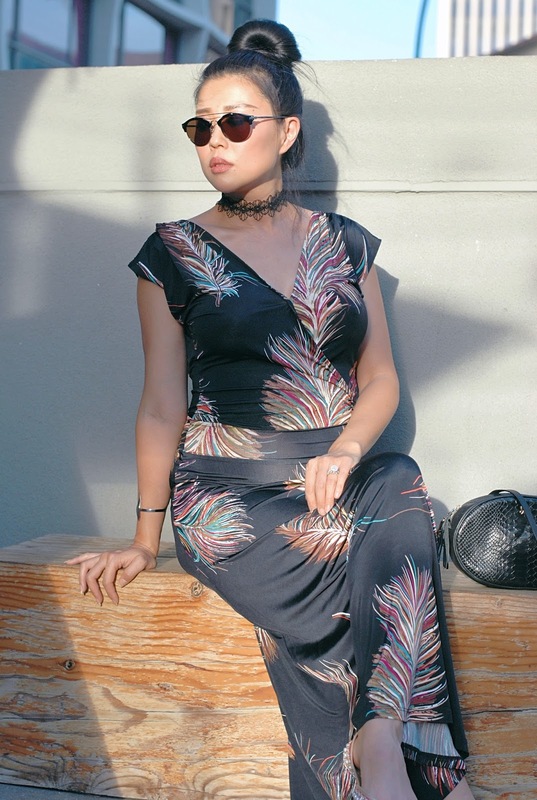 The 10 + year old maxi dress that made an appearance at the JINS Eyewear influencer dinner. I have to be honest. It was a struggle trying to figure out what to wear to host the JINS Eyewear influencer dinner at The Line Hotel last week. Although I'm in my third trimester and dramatically bigger, I stubbornly refuse to wear mumus or anything that resembles maternity clothes opting to steadfastly hold onto the belief that my closet is already filled with pregnancy friendly dresses. That means digging further and further back in there to find something that's comfortable yet event apropos-like this feathered maxi dress I purchased over ten years ago. The last time I wore it, I was attending a friend's B-school graduation in Philly. I don't even talk to that friend anymore. I've been on an events rampage lately, trying to get as much socializing out of my system as I can before burrowing deep in nesting mode before the baby comes. I got to catch up with a bunch of my blogger friends at the JINS dinner over yummy lettuce wraps and the best cheesecake of my life while introducing them to the popular and affordable Japanese eyewear boutique aggressively expanding into the US retail market. They currently have boutiques at Santa Anita and Fashion SquareI love the frames-light, stylish, and designed for the Asian nose. If your interest is piqued, here's a 20% discount to sweeten the pot. The hardest part will be picking a style as they have over 1,000 to choose from!